Corneille de Lyon was a Dutch painter active in France. It is not known if he trained in his native city of The Hague or in Antwerp. The first reference to the artist dates from 1533 when he is documented in Lyon. 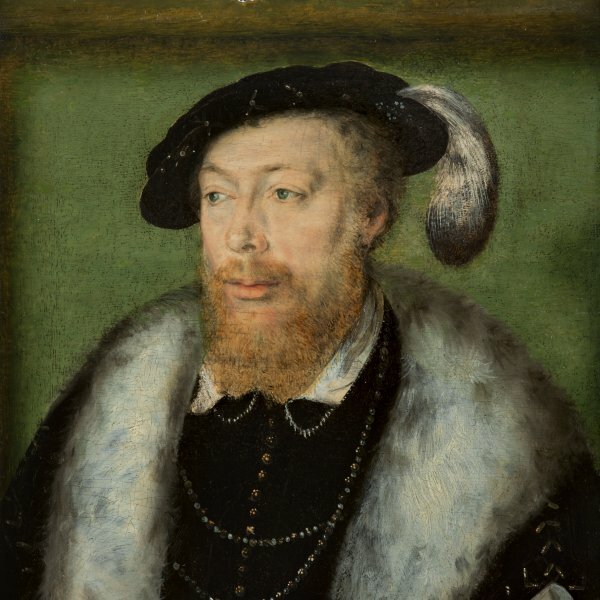 It was probably at this period that he became painter to Queen Eleanor of Austria, second wife of François I. In 1541 the artist entered the service of the Dauphin and when the latter was crowned Henri II in 1548 Corneille de Lyon became Painter to the King. One year later he acquired French nationality, which he retained for the remainder of his life. Corneille de Lyon married Marguerite Fradin, daughter of a leading printmaker in Lyon, a circumstance that gained him access to the city’s artistic circles. His three sons, Corneille II, Jacques and Clemence, became painters, creating a dynasty of artists that continued until the 17th century. The discovery of the Portrait of Pierre Aymeric and its acquisition by the Louvre has facilitated a reconstruction of this artist’s work. The portrait, which has an inscription by the sitter on the reverse recording the name of the artist and date, has allowed for the attribution of a group of portraits of anonymous sitters that were previously ascribed to anonymous artists. These works indicate Corneille de Lyon’s activities as painter to the middle classes and are more expressive, less rigid images than his portraits of the royal family. In general Corneille de Lyon’s work falls within the tradition of the smallformat portrait, in particular the style of Jean Perréal. His work also reveals affinities with the work of his contemporary François Clouet. Both artists looked to northern art and were interested in a naturalistic approach.